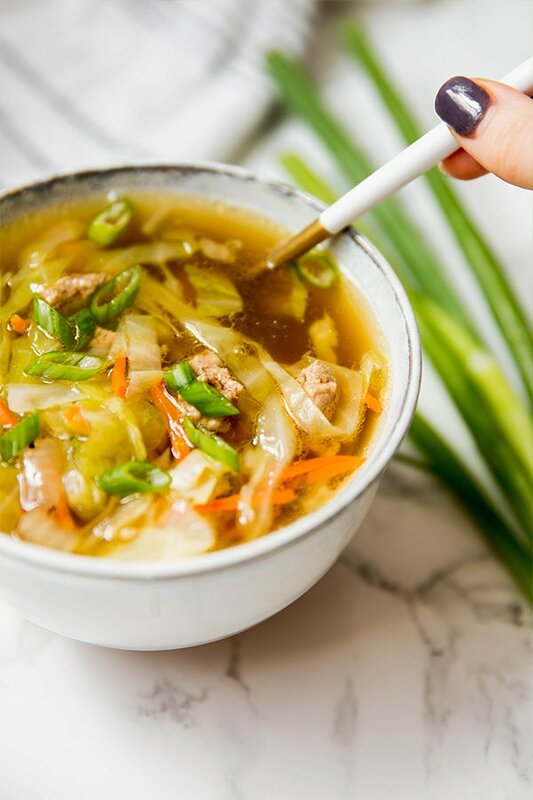 This paleo egg roll soup is a nourishing a delicious cold-weather dish that features all of the flavors of an egg roll without the wrapper! It’s AIP, and Whole30 compliant. Is there anything more comforting than soup? It’s warm, soothing, filling, and just all around perfect for this time of year. How about add one more layer of comfort food with a takeout dupe? Takeout may scream nostalgic comfort food more to me than soup does. We were always getting Chinese takeout, or picking up a hot pizza pie on the way home when I was a kid. 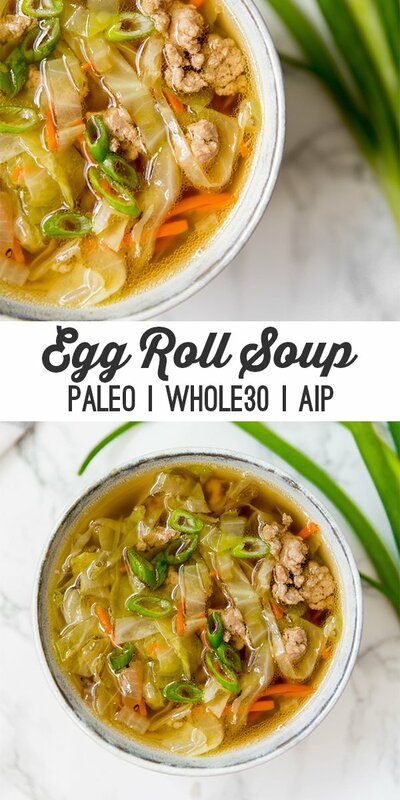 Now that my takeout days are far behind me and soup is my main comfort food, I decided to marry the two with this paleo egg roll soup! 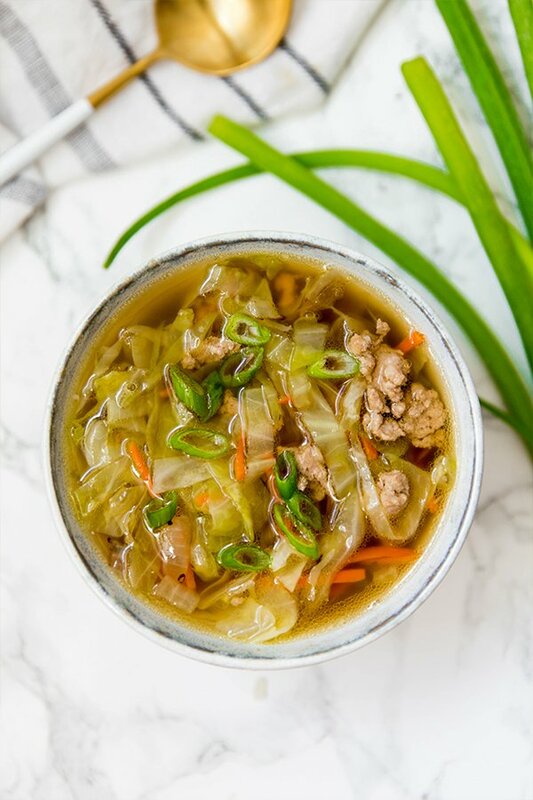 This recipe was inspired by the popular paleo riff on the egg roll, the egg roll in a bowl recipe. It’s a cost-effective and easy meal, and has been a reader favorite as well as a Hoover household favorite! Honestly, this recipe is comforting enough on its own, but it’s hard to get enough soup these days! Having this as a soup makes it far more warming than eating it as one pan meal alone, and it adds the benefit of using a healing homemade broth if you desire! You can use a homemade broth (which I always love) or whichever broth is your favorite. I’m used to using ground pork for this recipe, but you can easily use other meats. I would suggest ground chicken as the next best thing for this recipe. I’m obsessed with cabbage. It’s cheap, it’s nutrient-dense, and it cooks fast! Yes, you can buy a pre-made coleslaw mix to make this recipe even easier, but I prefer the texture and flavor from a fresh, whole cabbage. The rest of the veggies to round out the egg roll flavor. Coconut aminos is the soy sauce substitute in this dish. Ginger adds a bit of a spicy kick. 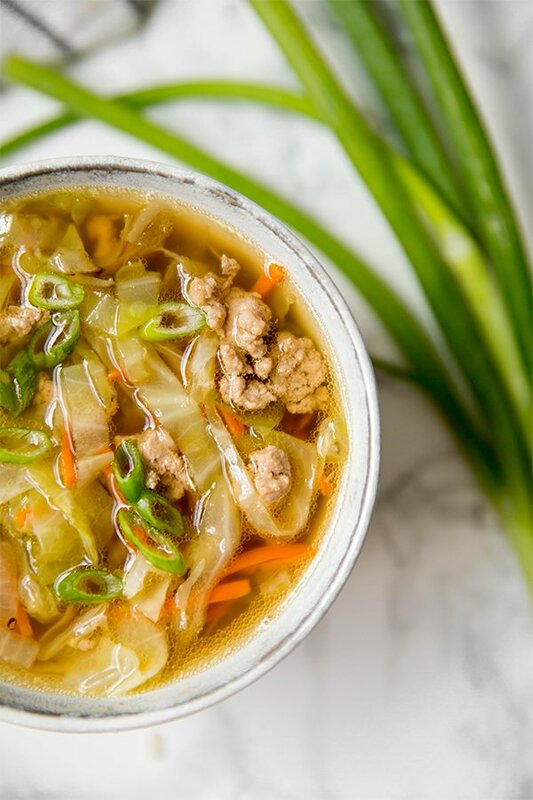 This egg roll soup is a warming and comforting dish that has all of the flavors of an egg roll! Using a large pot, brown the ground pork on medium heat and lightly salt. Set aside when cooked and discard the fat. Melt the coconut oil in the pot on medium heat and add the diced onion. Saute for 5 minutes or until lightly translucent. Add the carrot and gently saute for a few minutes until the carrots soften slightly. Pour in the broth, cabbage, cooked pork, coconut aminos, garlic powder, and grated ginger and mix well to combine. Bring the soup to a low simmer and cook for 15-20 minutes or until the cabbage is wilted. Season further to taste and top the soup with sliced green onion to serve. This is comfort food if there ever was any. I.love.this.soup. I add a fried egg and eat it for breakfast. So so good. Thank you so much Bek!! This was delicious! The whole family enjoyed it! I made this Thurs night and it was delish! I still have some leftover in fridge. Do you think it’s ok to eat tomorrow? I never know how long stuff lasts and I don’t want to waste this tastiness!!! Hey Tracy! For sure!! It would last at least 2-3 days in the fridge 🙂 Enjoy!! This was really easy to make and right on time for the cold weather. One adjustment I would suggest for the recipe is pepper. I eat egg rolls a lot (way too much actually) and they all have a peppery taste to them. That was maybe the only thing missing from this recipe. Otherwise it was great! Thank you so so much Bree!! Thank you SO much Allison! So happy you enjoyed it!! Very tasty! I used fresh ginger and garlic. I’d definitely make this again. It was super fast and easy. This was amazing!!! I used ground chicken, added black pepper, and for the liquid, 32oz miso ginger broth from Trader Joe’s plus 16oz regular chicken broth. Could you use shrimp as your meat? Thank you so much Linda!! I hope you enjoy! Sending tons of love on your healing journey! I made this with shrimp instead of pork and added water chestnuts for crunch. Turned out delicious! Friends loved it too. Thank you Michelle for another great recipe! Sure! I would just saute everything as usual and half the cooking time. Love this soup!! Does anyone know the macros on it? Yum! Will make again. On Whole30 this month and craving Chinese takeout…this will get me through it. Thank you! YAY! So happy you liked it, Naomi!! 🙂 Thank you! This was a huge hit! Super easy to put together, absolutely delicious! I made up some quinoa with chicken broth and added that just before serving so it would have enough protein for us. This recipe is a keeper! Thank you so much Pamm! So glad you liked it!! I’m curious, the ingredients list ginger powder and the instructions say grated ginger. Does it make a difference which I use? It looks like the recipe + ingredients have disappeared somehow…? It’s back up! Sorry, there was an outage on my site for about 30-40 minutes or so but it’s all good again 🙂 Thank you!! No worries! It was up in time to make dinner tonight 😀 It was delicious! Easy, quick and delicious. Added mushrooms, red pepper and Chinese 5 spice seasoning. Definitely would make this again! YUM! Thank you so much, Dianne! So good! Do you have the calories and macros for a serving? I give this soup 5+ I love this comforting, nutrient rich soup. Thank you so much for sharing. Thank you so much, Jeannie! !